Aligners are clear and look similar to tooth-whitening trays, but are custom-made for a better fit to move teeth. Some orthodontists and dentists have referred to them as "contact lenses for teeth." They are made of a strong medical grade plastic that is virtually invisible when worn. Align Technology, Inc., the company that manufactures Invisalign, was founded in 1997. Since then, Align has manufactured over 10 million aligners and 250,000 patients have received treatment. 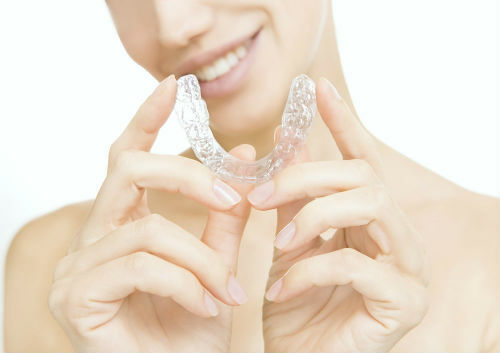 Aligners are clear and look similar to tooth-whitening trays, but are custom-made for a better fit to move teeth. Some orthodontists and dentists have referred to them as "contact lenses for teeth." Best of all, they are removable. Unlike braces, you can eat and drink what you want during treatment. You can also brush and floss normally to maintain good oral hygiene. Invisalign aligners move teeth through appropriate placement of controlled force on the teeth. The principal difference is that Invisalign not only controls forces, but also controls the timing of the force application. At each stage, only certain teeth are allowed to move, and these movements are determined by the orthodontic treatment plan for that particular stage. Invisalign is comfortable. There are no metal brackets or wires as with braces to cause mouth irritation, and no metal or wires means you spend less time in the doctor's chair getting adjustments. Invisalign allows you to view your own virtual treatment plan before you start so you can see how your straight teeth will look when your treatment is complete.